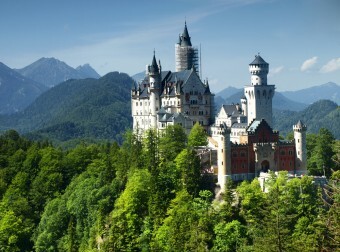 Today I found out that Cinderella’s Castle at Disney World and Sleeping Beauty’s Castle in Disney Land are modeled after Bavaria’s Neuschwanstein Castle. Each castle was also inspired by several other castles, including Fontainebleau and Versailles, but with Neuschwanstein’s dainty turrets and romantic views, it’s easy to see how one castle could take the credit for such iconic masterpieces. While today castles are generally used as elaborate mansions or tourist attractions, the original purpose of castles was, of course, to provide a defensive fortification against attack rather than a vast home that a prince could give his princess. Older castles are typically blocky-looking, with thick curtain walls and rectangular, crenelated towers. There had to be as few openings as possible in case of attack, so windows were kept at a minimum. With only practical furnishings and a few tapestries for decoration, it wasn’t exactly something out of Cinderella. Neuschwanstein Castle, though, was built in a style called “castle romanticism”, or “Romanesque” (though it also contains elements of neo-Gothic architecture). It is located near the village of Hohenschwangau in southwest Bavaria, Germany. It was commissioned by King Ludwig II in the mid-1800s. The king had lost his powers as a sovereign ruler after losing a war with Prussia, and supposedly wanted to design castles and palaces to make a kingdom where he could reign supreme—an idea so romantic Disney himself might have written it. The castle was built on the ruins of Hohenschwangau Castle and overlooked two lakes and the village. Situated on top of a hill, Neuschwanstein was not positioned for defensive purposes but because King Ludwig liked the view. He wrote to Richard Wagner, a man he admired, saying, “It is my intention to rebuild the old castle…in the authentic style of the old German knights’ castles.” He went on to add that “the location is one of the most beautiful to be found, holy and approachable” and equated the “lofty heights” of the new castle with that of Heaven. Like the older, more practical castles, Neuschwanstein does have a prominent rectangular tower, but it also boasts several cylindrical towers that are also featured on Cinderella’s Castle. The exterior is peppered with windows, turrets, and decorative chimneys, and the courtyard even boasts several frescoes. Decorations like these would not have been practical in an older castle, but provided inspiration for a fantasy castle like Cinderella’s which was more suited for a “happily ever after” than holding a defensive position. The interior of the castle is a monument to the courtly love found in fairy tales, featuring lofted ceilings dripping with chandeliers, colorful walls depicting tapestries of dragons and damsels in distress, and rich furnishings making the castle a work of art. King Ludwig had a personal hand in the design, which can be described as a theatrical setting. One of the designers, Christian Jank, drew inspiration for the castle from his time as a scenic painter. 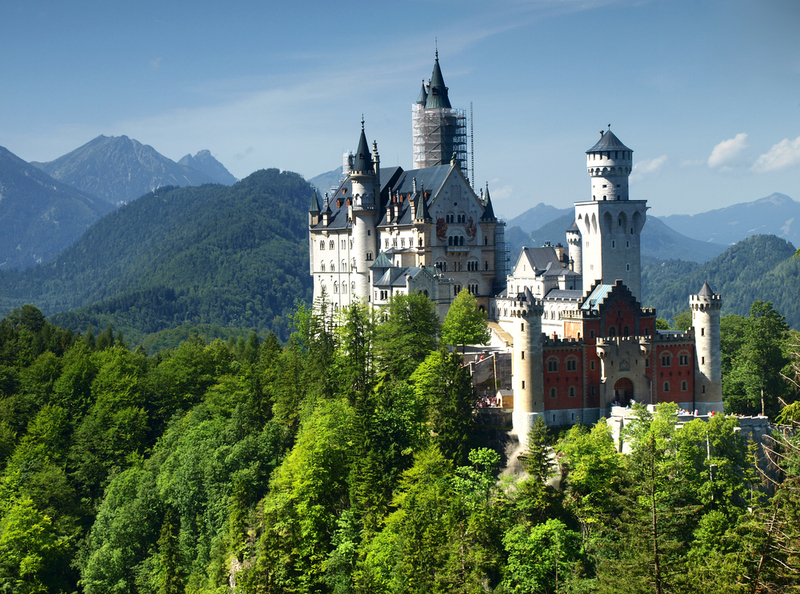 Ironically, despite commissioning and designing the fairy tale castle that would later serve as inspiration for Cinderella’s Castle, King Ludwig II did not have his fairy tale ending. Ludwig II was also known as “the mad king.” He ascended the throne at the young age of eighteen and admitted to himself, “I became king much too early. I had not learned enough.” He surrounded himself with theatre and romantic literature, and he tended to isolate himself—it was even said that he slept during the day and spent most of his time awake during the night. On June 10, 1886, a government commission arrived at Neuschwanstein in order to deliver the official order to depose the king. The king had sent his country into financial decline because of the building of his fairy-tale castles and had considered getting rid of his council and replacing them with fresh faces. He would not listen to a word his advisers said about finances. The commission took him into custody and declared him insane, though he was never examined. Because of his eccentric behavior and a brother who was insane, it was easy to declare that madness ran in the family, whether he was actually crazy or not. Three days later, the newly uncrowned Ludwig took a walk with one of the doctors responsible for declaring him insane, Dr. Bernhard von Gudden. No attendants followed them, and they were last seen around 6:30 pm in the evening. When they hadn’t returned by 8:00, a search was conducted. Three hours later, the bodies of both Ludwig and von Gudden were found in a lake nearby. Strangulation marks on von Gudden’s body suggested that Ludwig had killed him before likely killing himself. Official reports stated that Ludwig had died by drowning, but an absence of water in his lungs and his reputation as a strong swimmer suggest suicide instead. Ludwig never lived to see Neuschwanstein Castle completed, a feat that happened six years after his death. He had resided in the unfinished castle, but only for 172 days in total. Needless to say, Ludwig did not get to live happily ever after in Neuschwanstein, but he left behind the architectural design for Disney’s Cinderella and Sleeping Beauty to have theirs. It’s no wonder Ludwig II had an interest in building castles; his paternal grandfather, Ludwig I, was largely responsible for rebuilding Munich. After his death, Ludwig’s heart was removed and placed in the Chapel of Mercy beside his father’s and grandfathers as part of a Bavarian tradition. The “completed” Neuschwanstein Castle is actually unfinished. Only about fifteen rooms are furnished and fully decorated. Neuschwanstein was intended as the king’s private residence, but it was opened to the public on August 1, 1886, just a month and a half after the Ludwig’s death. Neuschwanstein is one of the most popular tourist destinations in Germany and has had over 50 million visitors. Neuschwanstein Castle replaced the ruins of Hohenschwangau Castle, while the new Hohenschwangau Castle sits on the ruins of Schwanstein Castle. The two places have confusingly swapped names. The castle was used as a temporary storage place for archivalia during World War II, after the facilities at Munich had been bombed. A meteorite that fell in 2002 near Hohenshwangau was named “Neuschwanstein” after the castle. Just a heads-up on a typo in the article: the village near Neuschwanstein is Hohenschwangau, not Hohenschwangu. The bonus facts have the village spelled correctly. In the body of the article you call Hohenshwangau “Hohenshwangu” missing the A as the second to last letter. Great site. I miss the podcast.